I just updated to 4.18 and they moved DestructibleComponent.h. It was originally located in "Components/DestructibleComponent.h" but now my includes are broken. Any idea where it was moved too? 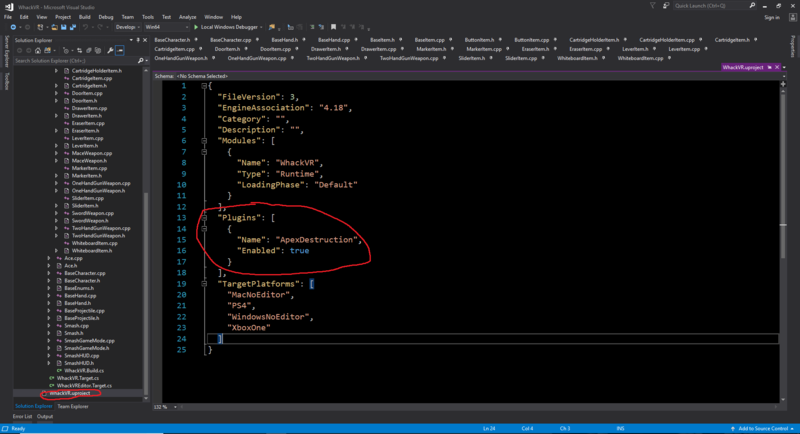 I can see its located in "Runtime/ApexDesturction/Source/ApexDestruction/Public/DestructibleComponent.h" when I browse the engine in the solution explorer but I am unable to #include it. Go to your project root folder then Source/YourProjectName/ open YourProjectName.Build.cs in PublicDependencyModuleNames.AddRange Add "ApexDestruction" module. Then in your code #include "DestructibleComponent.h"
Neither, did you manage to find a solution? After making the changes, save and delete the .sln files. Then rightclick on the .uproject file and re-generate visual studio files. Also try deleting any Saved, Build, and intermediate, temporary files. See if that works. Tried that, now, still nothing. Same problem for me, but it doesn not enough I still have a compilation error (can't include destructible component). Make sure you add this to the to the .uproject file and then rebuild the visual studio files by right clicking the .uproject in windows explorer. Fixed. Header has been moved, I just removed "Components/' part from my include and now it works.